Cathey and I have been impressed with the quality of musical programming that comes to our region in the south of France. I'm not talking about the cities of Beziers, Narbonne, Carcassonne, and Montpellier, from 15 minutes to an hour away and drawing some of the world's best acts in jazz, blues, ethnic, and world music. I'm talking about our little town of Quarante and the small villages within a radius of a handful of kilometers proximate to our portion of the Canal du Midi that have populations of under 5,000 souls. In some cases, concerts are presented by a cultural consortium sponsored jointly by the villages. One independent presenter is a group called C.A.C 34 (Artists Collective of Capestang). We've been to two of their shows and been blown away. The first featured La Mal Coiffée, a dynamite group of ladies who sang up a storm. For some reason, I missed reviewing that show. Next post. 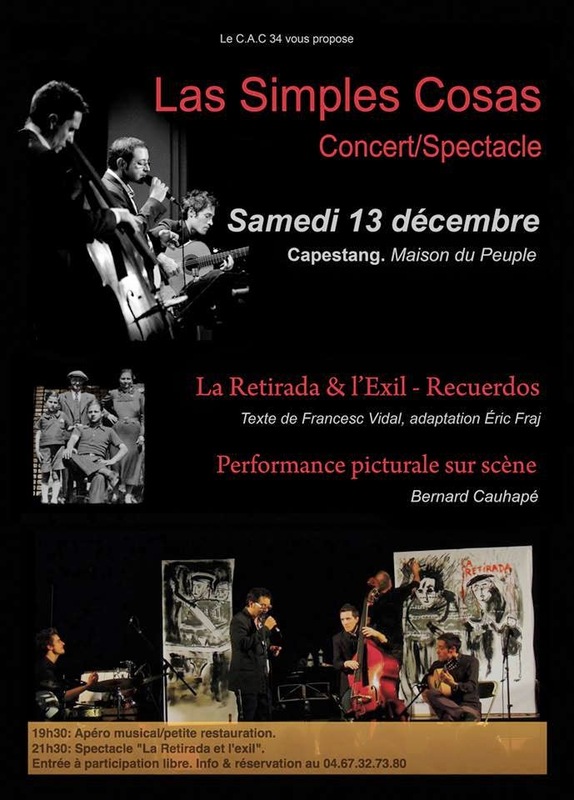 Last night, we were privileged to witness a special, multimedia performance based on La Retirada & L'Exil, a book written by Francesc Vidal, one of the hundreds of thousands of Spanish refugees who came to this part of France fleeing the ravages of the Spanish Civil War in the run up to WW II. Before the performance began, the elderly Vidal took the stage to introduce himself and his story. He talked of the importance of keeping the story alive for the generations that followed. The performance was interspersed with readings from his book by Eric Fraj, who adapted the story for the stage and who added his powerful voice to the early songs. Las Simple Cosas played numbers describing the times as well as tunes that were popular at the time. And behind the musicians as the show progressed, regional artist Bernard Cauhape painted two large panels depicting the story. The concert took place in the Capestang Hall of the People, a simple auditorium with a nice stage and decent sound and lighting that seats about 200 people. Las Simple Cosas is a trio comprised of Guillaume Lopez (flute and vocals), Morgan Astruc (flamenco guitar), and Pascal Celma (upright bass). They were joined by frequent collaborator Simon Portefaix (percussion). An uncredited - and I believe local - violinist joined the quartet onstage for the final couple of numbers. These young men are accomplished musicians. Their flamenco was spot on. When they moved out of the traditional and into more modern, brief, jazzy riffs, their improvisational skills were impressive. Many in the audience appeared to be of Spanish heritage and they were clearly thrilled and boisterously appreciative. The evening began, as these evenings often do, with aperos, the local term for aperitifs...appetizers. If you make reservations rather than just showing up for the concert, the folks at C.A.C. 34 prepare a plate of homemade munchies for 4 Euros ($5.00 at current rates) in this case consisting of a wedge of quiche, a chunk of cheese on a thin slice of bread, a smear of tapenade made from local olives on bread, and a bright red shredded beet salad. Cathey had a bowl of butternut squash soup ($2.50) and I had a wedge of a very thick and dark chocolate cake ($1.25). With 4 glasses of local wine at $1.25 apiece, the food - that substituted for our dinner - came to $18.75. The folks at the door seemed quite satisfied with our donation of 10 Euros ($12.50) for the concert, so the total for the night out, dinner and a show for two, came to $31.25. In the States, at our favorite venue for listening to 'serious' music, that would have been the price for one ticket. I couldn't find a video of the show or the trio in performance. I did find THIS, a video about the basic trio as artists in residence in an institution up towards Toulouse, I think.